One of the highlights of this year’s inaugural Classic TT in association with Bennetts will be the Classic Racer Magazine Classic TT Lap of Honour which is set to take place on Bank Holiday Monday and with the entry packed with both legendary riders and iconic, and exotic, machinery to match it promises to be something very special indeed. The current King of Mountain, McGuinness has now taken a staggering 20 TT wins whilst he’s also achieved more podiums – 41 – than any other rider. The outright lap record holder will ride his own 250cc Honda, a replica of the machine upon which he won his first TT race in 1999. McCallen was very much the man to beat in the big bike classes at the TT during the 1990s and won 11 race wins during his career, including four in 1996 and three in 1997. The Northern Irishman will take part in the parade on board one of his race winning RC45 Honda’s. German rider Waldmann made his name in the 125cc World Championship before going on to even greater success in the 250cc category. Twice runner-up to Max Biaggi, Waldmann won 20 GPs and stood on the rostrum 50 times and he’ll take part in the parade lap on the super exotic DKW taken to TT victory in 1938 by German rider Ewald Kluge, which is part of the Audi Tradition collection. Venezuelan Lavado was one of the most naturally gifted 250cc and 350cc riders of the late 1970s and 1980s, going on to win two 250cc World titles in 1983 and 1986. In total, Lavado took 19 GP wins and 42 podiums and will ride a replica of his 1983 World Championship winning machine for the Yamaha Classic Racing Team, Yamaha OW47. American ace Spencer remains the youngest ever winner of the 500cc World Championship, which he took in 1983, and two years later created history by becoming the first – and only – man to win the 250cc and 500cc titles in the same season. He’ll ride a 500 NS Honda..
Ballington came to the fore in the 1970s when he was a formidable privateer in the 250cc and 350cc classes and it was that form that saw him snapped up by Kawasaki. Four World titles and 31 GP wins followed on the ‘green meanies’ and he’ll make his first appearance on the Isle of Man riding a 750cc H2R Kawasaki for Team Collins and Russell. Like a number of his countrymen, Herreros was an expert in the small categories, with his greatest success coming on the Spanish Derbi machines. Nicknamed ‘Champi’, Herreros won the 1989 80cc World Championship and will ride that same machine here on the island. One of only two riders to win World titles in the 125cc, 250cc and 500cc categories, Read won 52 GPs and stood on the podium 121 times during his phenomenal career, the latter still the fourth highest total of all time. The 8-times World Champion will ride the 500cc RG Suzuki that he campaigned during the 1976 500cc World Championship for Team Classic Suzuki. The first American to win a motorcycle World Championship, Baker took the 1977 750cc title, also finishing second in that year’s 500cc series. Winner of the Daytona 200, Baker is back on the island riding a 1978 OW31 750cc Yamaha for the Yamaha Classic Racing Team. Since making his TT debut in 1996, Anstey has gone on to become one of the greatest road racers not just of his generation but of all time too. With eight TT wins and 27 podiums to his name, the Kiwi will take to the Mountain Course on the incredible, and iconic, Britten V1000 machine. Still the most successful motorcycle rider of all time, Agostini won 15 World titles and 122 GPs during his illustrious career as well as 10 TT Races, the latter all achieved on MV Agusta. Ago will take to the Mountain Course once more on the Yamaha Classic Racing Team 350cc Yamaha OW16 that took him to the 1975 350cc World Championship. Australian ace Carruthers took the 1969 250cc World Championship as well as TT wins on Benelli and Yamaha machinery before going on to become one of the finest GP technicians of all time, working with the likes of Kenny Roberts and Eddie Lawson. Will ride a replica of the Benelli machine that took him to that World title. A three times TT winner, no-one has won more Irish road races than Farquhar with the Dungannon rider having won a staggering 199 races! With ten victories at the Manx Grand Prix, the second highest total ever, Farquhar will ride the 500cc Paton that took him to five of those race wins. Despite still being only 24, Dunlop has already taken 7 TT wins and 13 podiums as well as being the current holder of two lap records and a great, record-breaking career lies ahead of him. He’ll ride the 500cc RGV Suzuki that Kenny Roberts jnr rode in the 1999 500cc World Championship. One of the finest road racers of the 1970s, Mortimer could ride – and win – on all classes of machinery although his greatest success came in the 125cc, 250cc and 350cc categories. 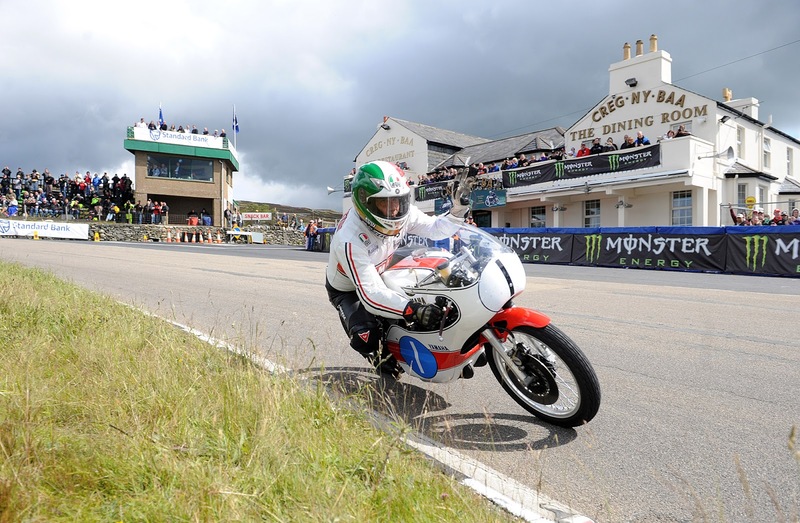 An 8 times TT winner, Mortimer will ride a 350cc Yamaha in the Classic TT Lap of Honour. Twice World Formula Two Champion, Reid was a road racer of the highest calibre right up until his retirement in 1994 and with 5 TT wins and 10 podiums, he’s still rightly revered amongst the racing fraternity. One of the famed ‘Dromara Destroyers’, Reid will ride a 500cc RG Suzuki for Team Classic Suzuki similar to what he raced in the 1980s. A multiple British Champion, Grant rode for the factory Kawasaki, Honda and Suzuki teams during his career, winning no less than seven TT, also taking the outright lap record along the way. The Yorkshireman will contest the parade lap on board the same Team Classic Suzuki owned 500cc XR34 RG Suzuki that took him to victory in the 1981 Senior TT. A former British Champion, Parrish rode for the Heron Suzuki team in the 1970s before switching to Yamaha in the 1980s, going on to manage the official Loctite-sponsored British team. Now a well-known TT commentator, Parrish gets to ride the ex-Noriyuki Haga 750cc OWL7 Yamaha. A formidable privateer throughout the 1970s and 1980s, Tonkin’s best days came during the 1980-82 period, winning three successive 250cc Vladivar Vodka Championships. He also took the 1981 Junior TT race on the Randle Armstrong before setting up firstly his own restoration business and more recently the production of café racers. This week will see the debut of the ‘Tonkin Tornado’. Former GP rider Taniguchi created history in 1959 when he became the first Japanese rider to compete at World Championship level, finishing 6th in Honda’s very first Isle of Man TT race. He continued to ride for Honda up until 1965 and will ride a 250cc machine in the Parade Lap. Son of 1949 500cc World Champion Les Graham, Stuart rode for both the Honda and Suzuki factories during the 1960s, enjoying his best season in 1967 when he took third place in both the 50cc and 125cc World Championships. He won the 50cc TT race that year on the little Suzuki before going on to achieve success on four wheels. The first American to have ever won a TT, Classic race exponent Roper took the 1984 500cc Historic race and will be back on the island riding a 350cc 7R AJS for Team Obsolete. With over 100 entries, other star riders include 1985 Production TT winner Mat Oxley (Yamaha R1), Finnish ace Pentti Korhonen (1972 250cc Yamaha), Malcolm Wheeler (250 RD05A Yamaha), Richard Quayle (Yamaha FZR750), Dan Cooper (500cc OW45 Yamaha), Steve Mercer (Yamaha OW01), Mark Miller (750cc OU45 Yamaha), Dan Kneen (Honda RC30), Ian Richards (Yamaha TZ250), South African Les van Breda (500cc RG Suzuki), Nigel Rollason (Yamaha TZ350), and John (Norton Metisse 850) and Derek Brindley (Yamaha TZ700).